In early spring / late winter it may seem odd to be talking about clematis, which are so closely associated with summer in most people’s minds. But with the unseasonably mild weather that we’ve been having, clematis are starting to sprout, and before you know it, the early (Group 1) clematis will be flowering. Group 1 Clematis (Early flowering) - These include many of the species Clematis such as Clematis cirrhosa, Clematis armandii, and the almost ubiquitous, but still fabulous Clematis montana. Early spring is also the time to prune the autumn-flowering clematis (Group 3) such as Clematis tangutica and viticella. So here’s our quick guide to caring for clematis. First of all, they are very easy to grow. Most clematis don’t really mind what type of soil they’re in (read our article on soil types), and any reasonably fertile topsoil will do. You can even grow them in quite small spaces or pots, although you’ll want to buy topsoil or some good quality compost for them, available from topsoil suppliers. If the plants that you buy are very little, pot them on and nurture them for a year or so before you plant them out into your garden. Next, get your pruning right. It’s pretty easy to remember, because pruning goes by flowering time. Spring flowering clematis (Group 1) flower on last year’s growth. So don’t cut them back at all until after they’ve flowered. You don’t actually have to prune this group, but if you do need to, then do it as soon as possible after they’ve flowered, and avoid cutting them back hard. Large summer-flowering clematis (Group 2) are generally the named plants, rather than species. They don’t need hard pruning, but cut back gently after flowering, and you may get a second flush of flowers later in the season. If you do have to cut them back hard, do it early in the season. Autumn-flowering clematis (Group 3) flower on this year’s growth. So you need to cut them back to about six inches above the ground, to a bud, in late winter or early spring. If you wait until they have sprouted, you can cut them back to a good strong bud, and be confident that they’ll grow. 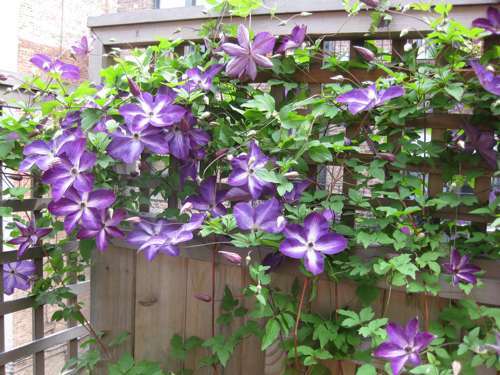 All clematis need something to scramble over, whether it’s a trellis or a bush. And if you want them to grow up a bush or tree, give them a stick to climb up to reach it. It’s very easy to train them, but once they’ve decided to go one way, it’s quite hard to persuade them otherwise without breaking stems. So keep tying them in as they grow. And finally, some clematis are much more vigorous than others, so be careful what you buy, especially for a small space!